Objective: Choose the proper protection for pesticide application. Present the information below on different types of PPE. Use PPE and pesticide labels as visual aids for this session. Based on the recommendations provided on the labels, point out what equipment to wear during pesticide application. Have workers examine pesticide labels and determine what equipment is required. Different Personal Protection Equipment (PPE) is available for use with pesticides. Pesticide labels give minimum requirements. The Environmental Protection Agency (EPA) provides resistance ratings for equipment. Remember that more is better! For more details, see all the Tailgate Safety Training modules on pesticides. Wear unlined, elbow length, chemical-resistant gloves when handling any pesticide concentrate or chemical labeled DANGER, POISON, or WARNING. Not all gloves are suitable for all chemicals. Contact the glove manufacturer to determine if a specific glove is suitable for a particular chemical. Check gloves for holes or leaks. To check for leaks, fill the gloves with water and squeeze. Throw the gloves away if water squirts through a hole. Leaks or holes in the gloves can expose the skin to chemicals. Either tuck gloves into shirt sleeves or vice versa. This prevents the chemicals from getting inside the gloves at the cuff. Before removing the gloves, wash them with detergent and water to prevent contaminating the hands. Never wear cotton or leather gloves. They do not protect against skin exposure. Instead, they absorb the pesticide; workers are exposed again each time they wear the gloves. Wear unlined, lightweight, nonabsorbent boots that go up to midcalf. Wear long pants over boots to avoid getting pesticides inside the boots. After each use, thoroughly wash and dry boots inside and out to remove residue. Always wear gloves when cleaning contaminated footwear or any equipment. 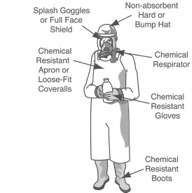 Wear tight fitting, non-fogging chemical splash goggles or a full face shield with splash protection. Straps should be nonabsorbent. Clean the eye protection and wash the sweatband after each use. Wear a waterproof rain hat or washable, wide-brimmed hard or bump hat. Or, wear the hood of a disposable suit. Avoid cotton and felt hats. No ball caps; they absorb pesticides. Workers are exposed again when they wear the hat again. Spraying contaminates clothing, so be sure to wear fresh clothing daily. Remove contaminated clothing starting at the top and moving down. Roll clothing off, rolling contamination inward to prevent spreading. Wash contaminated clothing separately from other laundry. Dispose of hooded disposable suits and items that are saturated with pesticides. Drop into plastic waste bag rolled in an open position. Wear a respirator when the pesticide label recommends it. It will be necessary to wear a respirator when handling concentrated, highly toxic pesticides. Be sure that the respirator fits properly and is the appropriate type for the hazard. Wear only respirators approved by the National Institute for Occupational Safety and Health (NIOSH) with the correct filter. Wear the right equipment for the job. Never use faulty or worn-out equipment. Always wash thoroughly when finished with pesticide applications.